With Congress’s recent passing of the Defend Trade Secrets Act (DTSA), it is critical that employers review their policies, practices, and procedures surrounding their proprietary information. The DTSA provides new protections and penalties that were previously unavailable to employers. Critically, the DTSA creates a federal private civil cause of action for trade secret misappropriation. In the past, protections were minimal and varied state by state. Under the DTSA, the law is federally standardized, and plaintiffs can file civil claims for trade secret misappropriation in federal district court. The DTSA does not preempt existing state laws, so plaintiffs may elect to bring trade secret claims in either federal or state court. Remedies for misappropriation of trade secrets include injunctive relief and damage awards, as well as attorney fees and exemplary damages for willful and malicious misappropriation. In addition, litigants may seek relief via a new recovery mechanism: ex parte seizure orders. That is, in “extraordinary circumstances” law enforcement officials may seize trade secrets and bring them within the custody of the court. Finally, the DTSA provides new whistleblower protections, which provides immunity to employees who disclose trade secrets where the disclosure is made in confidence to government officials for the purpose of reporting illegal activity, or when the trade secret is disclosed in a document filed in court under seal. In order to utilize these new federal protections, employers should become familiar with the act and update employment and confidentiality agreements as necessary to derive maximum benefit from the DTSA’s protections and remedies. The America Invents Act introduced inter partes review (“IPR”) as a mechanism to challenge the validity of a patent on the grounds of novelty under § 102 or non-obviousness under §103. 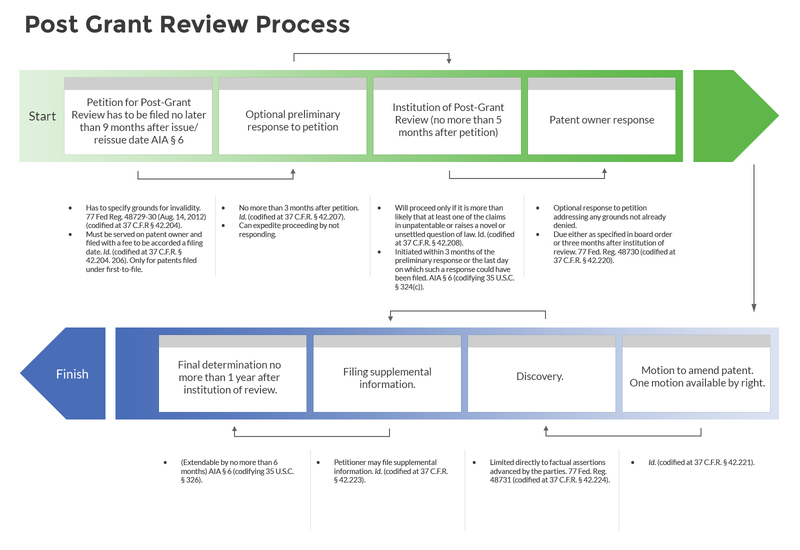 As a replacement to inter partes reexamination, IPR procedures offer an abbreviated timeline and elements that more closely resemble litigation. Anyone other than the patent owner can file a petition for an IPR. The petitioner must pay a filing fee and adhere to the timing requirements detailed in the figure below. If the petitioner shows a likelihood of prevailing on at least one of the claims, the Patent and Trademark Office (“PTO”) will issue an institution decision. An institution decision is non-appealable and no formal estoppel attaches to the petitioner if the PTO issues a decision not to institute. If the PTO institutes an IPR, administrative patent judges have twelve months to issue a final written decision. During this time, federal courts may stay litigation and wait to proceed until a final decision has been rendered in the IPR. In the IPR, parties may file motions, conduct limited discovery, and present arguments at an oral hearing. Unlike in district court litigation, the petitioner only needs to prove invalidity by a preponderance of the evidence rather than by the clear and convincing evidence standard. Consequently, petitioners have experienced greater success in challenging validity of patents via IPRs than via district courts. After the final written decision is issued, either party can appeal to the Federal Circuit. If the petitioner ultimately loses, she is estopped from challenging validity based on all references raised or that reasonably could have been raised in the IPR. The petitioner is then left with non-prior art invalidity defenses (lack of written description, enablement, or subject matter) or unenforceability defenses in subsequent litigation. The America Invents Act (“AIA”) created post grant review as a means to challenge the validity of patents on any ground that could be raised under 35 U.S.C. § 282(b)(2) and (3), including lack of novelty, obviousness, and violations of § 112 (except best mode). Post grant review proceedings initially take place at the Patent Trial and Appeal Board (“PTAB”). Any appeal from a post grant review is immediately reviewable by the Court of Appeals for the Federal Circuit. A post grant review is initiated by a third party filing a petition within nine months of a grant of patent or issuance of a reissue of patent. The patent holder may file a preliminary response to the petition. The PTAB may institute a post grant review upon a showing that it is more likely than not that at least one of the challenged claims is unpatentable, or that the petition raises a novel legal question that is important to other patents or patent applications. If the post grant review is instituted, the AIA requires the PTAB to issue a final written decision within one year. Upon a showing of good cause, however, this period may be extended by up to six months. A petitioner can move to stay simultaneous litigation in a federal court at any time during the post grant review; however, the petitioner is more likely to succeed after the PTAB institutes the petition. Similar to federal court litigation, post grant review makes use of several litigation-like devices such as limited discovery, protective orders, and settlements. In a post grant review, estoppel attaches after the PTAB’s final written decision. Estoppel applies to any grounds that were raised or could have reasonably been raised during the post grant review. Lastly, the petitioner is estopped from raising these grounds in district court litigations, USPTO proceedings, and ITC proceedings.